Toenail fungus (Onychomycosis) is usually caused by dermophytes (a group of fungi). Dermophytes live off and thrive on keratin and skin (components of nails and hair). This fungus gets below or under the nail into the nail bed and starts to multiply rapidly. Dermophyte fungus then turns the nail yellowish brown, dark, and sometimes unnaturally white. The damage to the nails becomes so extreme that they may turn hard, thick, become extremely brittle, and eventually fall off. Dark and discolored nails could also be a result of the dermophyte fungus. Fungus tends to live in damp, moist, and humid conditions. It lives off humidity and wetness and is very commonly found in swimming pools, locker rooms, and shower areas. Hikers and trekkers who have to cross wet streams or ponds have also contracted the toenail fungus due to damp socks and shoes. People with low immune systems and underlying health conditions like diabetes, circulatory issues and so on are known to be susceptible to nail fungus. It is challenging to understand the nature of the fungal infection since it might not be easily detected. Thankfully, the treatments for fungal nails are readily available and can be purchased easily. When your nails are clear and you’re ready to get out in the sun find the best tanning lotion so you can flaunt your fungi-less nails. Here are 2 ways that you can try to curb the spread of toenail fungus at home. While these remedies are effective, they are not permanent solutions. Mouthwash: Store-bought mouthwash contains menthol, eucalyptus, and thymol that have antifungal and antibacterial properties. Add 2 capfuls of mouthwash solution to a bucket or shallow tub of lukewarm water. Soak the affected foot or hand for half an hour daily to kill the fungus. Tea Tree Oil: Tea tree essential oil has antiseptic and antifungal properties that help disinfect and kill the toenail fungus. Apply tea tree oil directly onto the affected nails with a piece of cotton. Do this twice daily to curb the spread of toenail fungus. Most toenail fungus’ can be cured with the correct treatment found in gels, creams, body washes, or bath soaks. Let us look at some medications that can be purchased over-the-counter. These products are reviewed from lower to higher price points. The Kerasal Fungal Nail Renewal helps improve the look and health of the infected nail in a week’s time. It comes in a 10ml tube with silicone tip applicator that allows the discharge of the product directly on to the affected areas. This method is useful to protect your hands. Inexpensively priced, a 10ml tube of Kerasal Fungal Nail Renewal gel is useful for 3 months period. 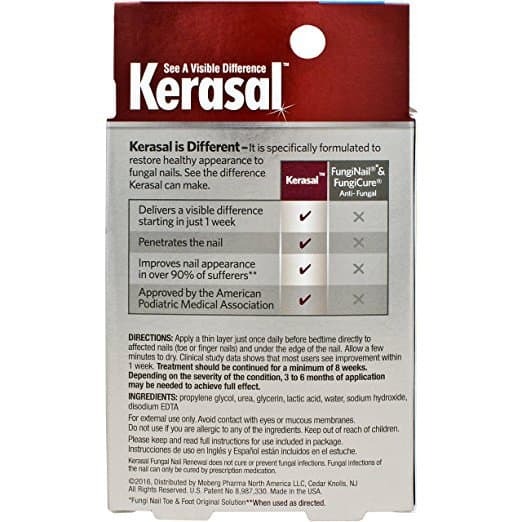 Approved by the American Podiatric Medical Association, the Kerasal Renewal helps in reducing discoloration of the nail, reducing the thickness, rehydrating brittle nails to become stronger. 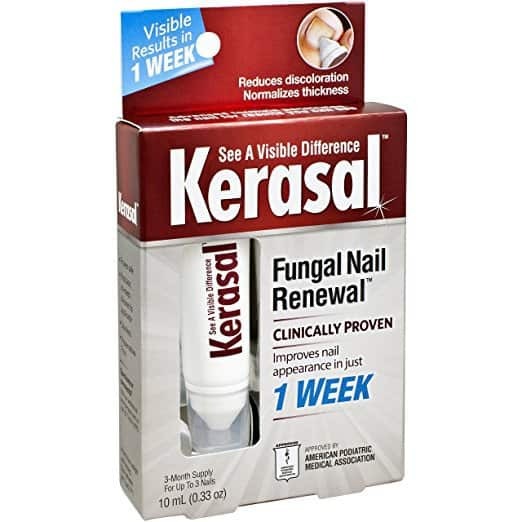 The formula in the Kerasal Fungal Nail Renewal Treatment combines propylene glycol that hydrates the nail, urea, lactic acid, and keratolytic that helps penetrate the nail and renew nail appearance without filing or cutting the nail. The blend of these ingredients help soften, soothe, and revitalize the damage caused by fungal infections and gives visible results from the 3rd and 4th application. The ArtNaturals Essential Body and Foot Wash with peppermint, tea tree, and eucalyptus oil is a soothing, deodorizing wash that helps alleviate the irritation and itchiness on skin and nails. It helps heal athletes foot, kills nail fungus, ringworm, and jock itch. With antifungal, anti-germ, and antiseptic properties, and a combination of rosemary, oregano, olive oil, and jojoba, this body and foot wash from ArtNaturals helps in removing dirt, oil, and bacteria successfully in a few washes. Readily available online, the liquid has a fresh scent, lightweight texture, and a moisturizing effect on the skin. This antifungal wash is ideal for people who lead active lifestyles or have a skin condition like psoriasis and fungal nails and skin. Children, young adults, adults, and senior citizens can use this body wash with ease for a clean and refreshed skin and nails experience. The therapeutic soap and soak from Oleavine All Naturals is a boon for people suffering from body odor, athletes foot, psoriasis, toenail and nail fungus, yeast infection, jock itch, acne, and skin irritation. The Oleavine Tea Tree Oil Soap is available in 355ml or 12 fl. Oz bottle for easy use in the shower or while soaking in the bathtub. It contains no preservatives, petroleum, dyes, synthetic fragrances, thickeners, or silicone. It is also gluten-free and contains extract of neem leaves which has been used to combat skin blemishes, discomfort, and odor since generation. It also contains broad-spectrum essential oils, tea tree oil, skin moisturizing omegas 3, 6, 7, and 9, and mixed mint essential oil for a cooling effect. The Therapeutic Tea Tree Oil Soap help fight body acne, facial acne, itchy and dry skin, rashes, body odor, and fungus to leave the skin feeling fresh, rejuvenated, and healthy. You can use this body wash daily without having to worry about irritants or skin issues. Like the Oleavine TheraTree soap, the Purely Northwest Antifungal Tea Tree Oil and Body Wash is also a fantastic product that can be used daily. With a robust defense mechanism against toenail and nail fungus, armpit odor, jock itch, athletes foot, eczema, psoriasis, itchiness in the skin and scalp, this could honestly be a miracle body wash.
Made in the USA, Purely Northwest is cruelty-free and has never been tested on animals. It contains no parabens, no added synthetic dyes and fragrance, and no petroleum or silicone. The solution is infused with Atlantic sea kelp, vitamins A, B1, B2, C, D, and E, aloe vera to condition the skin, and oils like eucalyptus, tea tree, peppermint, and oregano to help soothe the skin to leave it feeling soft and fresh. This wash is ideal for people living an active lifestyle and those living in wet and humid conditions. It is also suitable for young adults and children who play sports at school. The Zane Hellas Fungus Stop is a solution made especially for toenail and nail fungus and is made with all natural herbal ingredients. Infused with the power of oregano oil, it helps kill and dry out the fungus much faster than other solutions. Containing essential oils of tea tree, organic calendula, organic avocado, and vitamins A, C, and E, this solution can be used to treat the fungus on hands and feet. Packaged comfortably in a 10 ml bottle, the Zane Hellas Fungus Stop is easy to carry and reuse whenever needed. A brush applicator makes it easy to reach hard places like under the tip or the nail. The active ingredient in the Zane Hellas Fungus Stop is Carvacrol that has potent antifungal properties and is known to kill bacteria and fungus at a high rate. This solution helps in restoring the color to nails and making the nail healthier. The FineVine Super Balm is an antifungal balm made in the USA that contains extracts of eucalyptus oil, tea tree oil, rose geranium oil, and lavender oil. The safe but potent mixture of the FineVine antifungal balm helps in alleviating fungal infections, toenail and nail infections, symptoms of ringworm, athletes foot, ringworm, jock itch, and eczema. Additionally, it helps to hydrate the skin and prevents itchy and scaly dryness and irritation. This is one of the few balms that help in avoiding future flare-ups in the same location. Apart from this, it also helps in curing hardened skin to make it soft and supple and works wonderfully on hardened and chapped heels. It contains coconut oil, olive oil, canola oil, tea tree oil, beeswax, vitamin C and E. these ingredients actively contribute to protecting and nourishing your skin even while you go about your daily work and chores. The formula from Buoceans Bright Pencils is a fast-acting, dual soak and topical application treatment for extremely damaged nails due to nail fungus. This tincture helps treat fungus and removes yellow, brown, and dark discoloration from the nails. It also helps in restoring hard and brittle nails to soft and healthy ones. It also allows nails recover from split nails. Visible results of the Buoceans Bright Pencils are seen within two to four weeks due to daily application. Depending on the scale and degree of fungal infection, the antifungal tincture can be applied 3 times a day if necessary. Available in a pen/ pencil application, the serum needs to be applied directly to the affected area of the nail and surrounding area that contains the infection. While using, ensure to add some to the bed of the nail (below the tip). This solution can be used daily to help in regrowth of healthy nails even after the infection has disappeared. The Manuka Oil treatment from PUR360 is known to be 33 times more efficient in treating nail fungus and skin ailments than tea tree oil. This oil serum helps in the treatment of irritated skin, rashes, skin and nail fungus, cold sores, eczema, body and face acne, and psoriasis. The packing of the PUR360 Manuka Oil is in a 10ml bottle with a dropper for easy application of the oil. The dropper and cap help in preventing leakage and spillage of the oil during application. The dropper also helps you in using the exact amount of dosage and per the scale and spread of the fungus. Manuka oil is a natural antiseptic and can also be used to treat jock itch, athletes foot, rashes, staph infection, infected cuts, rashes, scrapes, and fever blisters. It also contains anti-inflammatory properties and can be used on blisters, stings, bites, and dermatitis. The NonyX Fungal Nail Clarifying Gel has been proven clinically effective in a placebo-controlled study by researchers. It helps in clearing out keratin buildup of yellow, brown, and dark nails and helps restore nails to their original shine and health. This clarifying gel is also safe for diabetics who do not have earlier cuts and nicks on the feet and hands. The NonyX Fungal Nail Clarifying Gel is cruelty-free and has never been tested on animals. It is also considered the favorite of most doctors. It contains deionized water, mild fragrance, xanthum gum, and ethanoic acid to help combat the keratin buildup of nail fungus. This product comes with a money back guarantee in case the NonyX Fungal Nail Clarifying Gel does not work correctly on fungal nails and toenails. Packaged in an easy-to-use bottle, the NonyX gel can be used daily depending on the nature and spread of the fungus. The Puriya Wonder Balm lives up to its name by being one of the most effective treatments for fungal nails. Like the NonyX Fungal Nail Clarifying Gel, this balm also comes with a money back guarantee in case the product does not ease or soothe affected areas of the skin and nails. The Puriya Wonder Balm helps eliminate odor, fungi, and infection, and softens the skin while hydrating it. Containing beeswax, olive oil, tea tree oil, eucalyptus oil, and lavender oil, the natural antimicrobial and antiseptic balm helps stop the spread of infection to other parts of the body and reduces inflammation in the affected areas. The Puriya Balm works longer than other gels, creams, oils, and ointments to combat toenail and nail fungus even hours after the initial application. This balm is excellent for people who use public swimming pools, shower in common hostel baths or gyms, who play martial arts, and those involved in physical labor and activities. Nail fungus, as you might know, is a widespread problem for many people. If you have it, there’s nothing to be worried about. It is curable if treated the right way. You must take care while treating nail fungus since it can get under the skin through the cracks in your nails. Your nail may also get thicker with time or might change color. The changes happen due to the fungus lurking in your nail and nail bed. We’re here to answer the common questions that most people have about nail fungus. Fungi are tiny microorganisms that cannot be seen with the naked eye. The fungi that affect the nails tend to thrive in soggy, damp, or wet areas. The formal name of toenail fungus is onychomycosis (pronounced oniko-my-koses) or tinea unguium. When the fungus infects the skin due to humid conditions, there is a buildup of infection which causes a series of issues for the toenails or fingernails. The infection takes time to develop and might be visible at first. However, once the infection takes root, you might start seeing changes in the appearance of the nail like the thickness, color, cracking, and so on. What does the Nail Fungus look like? The nail fungus may infect the entire nail, a part of the nail, or several nails on the hands or feet. What are the available treatments for Nail Fungus? Treatment for nail fungus varies depending on the severity of the infection. Sometimes, a quick home remedy can halt the spread of the infection, while sometimes it may take up to a year of treatment. In severe cases, the nail fungus keeps reoccurring even after treatment. Do not attempt to take any medication for toenail fungus without first consulting your doctor. In some cases, the nail might be crumbling, scaling, or breaking due to entirely different medical reasons. Only take medication in the prescribed doses when advised by a doctor. Essential oils like tea tree and oregano may be lightly brushed on the affected area twice a day with a cotton swab to help cure the toenail fungus. Dipping the infected nail in a mixture of 2 parts warm water to one part of vinegar may also be a safe home remedy to try. Listerine mouthwash contains eucalyptus, menthol, and thymol that have antifungal and antibacterial properties. Soaking the infected toenail in Listerine daily for 30 minutes will also help ease the infection. Topical treatments like creams, gels, and salves can help in reducing the infection and slowly curing the nail of the fungus. Use a topical balm like Puriya Wonder Balm or Pur360 Manuka Oil to help treat nail fungus from the comfort of your home. Topical ointments and treatments are known to help cure toenail fungus faster than home remedies. In severe cases, it is recommended that laser treatment is done to attack the fungus living under the nail without damaging the nail bed. Laser treatment not only helps protect the nail but also prevents the infection from spreading to other unaffected areas of the nail. In some cases, the fungus infects the nail matrix. Even removal of the entire affected nail does not guarantee a clean nail if the nail matrix is infected. In such cases, surgery is advised to cut out the infected nail matrix cleanly. Doing this will help prevent the growth and resurfacing of the fungal infection. How to prevent toenail fungus? A few lifestyle changes can help prevent toenail fungus. Washing your hands and feet with an antibacterial wash, drying your feet immediately if they get wet, wearing fresh and dry socks, and using antifungal sprays or sanitizers on your hands and feet are a few ways to prevent toenail fungus.